As Ruler of the Moon Gabriel can help you to draw on the true feminine power of the moon, allowing you to develop your intuition as well as understanding and realising your true potential. Maximum time of benefit is the day of full moon. Angels are usually thought to be without gender, but Gabriel is considered a feminine energy. You can use one of the following crystals to help in your invocations: moonstone, which is for developing inner wisdom and resources and learning to follow your hunches, or selenite, which is associated with the moon. You could also use a general angelic stone such as milky quartz or angel hair quartz. Invoke Gabriel by name three times, and then ask her to help you focus the powerful energy of the moon to your heart and your mind, to develop your intuition, in Love and Light, Love and Light, Love and Light. 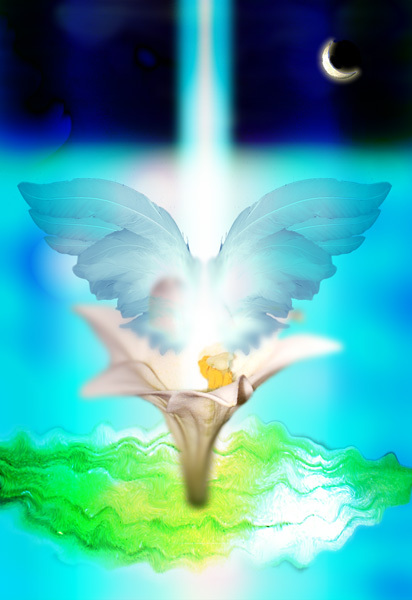 Ask Gabriel to completely surround you with protective pure white light during this meditation. In your mind see the radiance all around you. Imagine roots growing from your feet into the floor, anchoring and grounding. Feel yourself relaxing and going deeper. Let external sounds become part of the background, and maintain your focus within heart. Visualise the meridian line within your body, extending downwards. It reaches from the crown on top of your head, through the major chakras - your brow, throat, heart, solar plexus, sacral and finishes at the base of your spine, base/root chakra of your being. Visualise the moon and imagine her pure light. Draw this silver radiance down into your crown, which is your spiritual connection to the cosmos. Next feel the energy filling your brow, reaching your intuition, subconscious and the world of your dreams. Now it travels down to your throat, which is your power of creative expression. You can also ask for Gabriel’s help to focus the powerful energy of the moon to your heart, to clarify your life purpose. Now imagine the energy flowing further down the meridian line and completely filling the column within your body, travelling down your legs and tingling in your feet. Through your feet send energy to the heart of Mother Earth, and ask for her blessing on your life path and new aspirations. Bring the power of Mother Earth back into your energy meridian. Feel the combined powers of Earth and Moon filling the cells of your body. Ask to understand your own true potential and for the ability to develop into it for your highest good. Feel yourself filled with purpose and a renewed sense of direction. Enjoy! Open your eyes when ready and stamp your feet if you feel you need to ground your energies. Remember to always thank the angels for their loving assistance. Acknowledgement: Beautiful image of Gabriel by Richard Rockwood, from Angela McGerr's Harmony Angel cards, published by Quadrille.